Measured along the diagonal from the top left hand corner to the toe, the stocking measures 20 inches, and the width along the cuff is 9 inches. This is a large personalized Christmas stocking that is plenty wide to fit lots of presents. We have a couple other similar designs so the whole family can have a matching set. Click on these following links to view them! 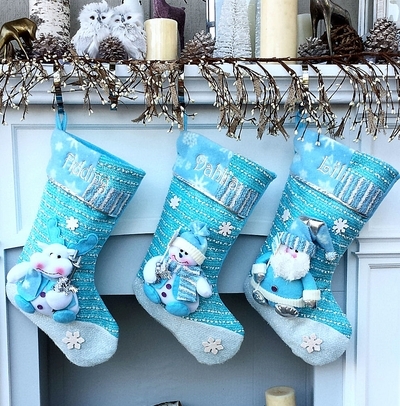 Lining: The Christmas stocking is lined and padded inside in light blue felt. Materials: Base is blue felt with exterior covered with chenille knits, metallic fabrics, fleece patches and the snowflake decorations on the stocking body are white plastic sparkled with shimmering glitter. Names can be personalized on the white plush cuff of this Christmas stocking with Silver Metallic or Lavender Metallic embroidery thread to compliment the color of the stocking. We have a sample picture of the stocking monogrammed with our gorgeous silver metallic embroidery thread ... click on the thumbnail image in the top right hand corner of this page to see a larger version.